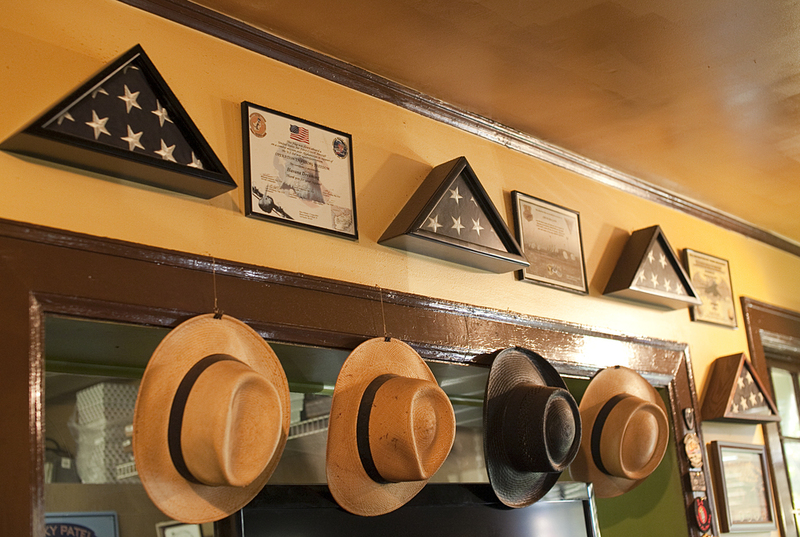 All of us at Havana Dreamin' want to give a shout out to the men and women serving in the military who put their lives on the line every day so we can enjoy the freedom they protect for us! We'd also like to thank each and every one of our customers who have supported the troops by giving their time, donations and cigars for us to send overseas! A special thanks goes out to former Marine Lee Owen who organized the Cigars for Troops benefit bar-b-q. Please take a moment to check out the photos and letters and e-mails so you can see your good deeds at work in Iraq and Afghanistan! 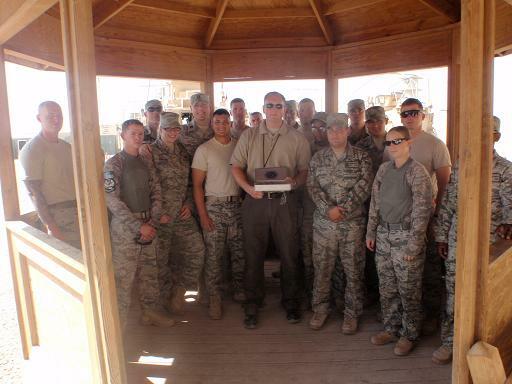 We'd also like to recognize the local 908th Airlift Wing who have recently deployed! Stay safe!!! If you would like to contribute cigars or make a donation stop by Havana Dreamin' and drop something in the box! Unbelievable! Only word to describe the box of cigars! Within minutes I was getting smiles from guys getting cigars. Best job of the day! So far, in the joint HQ all services have received a cigar...I am headed to the CDR of the subordinate Task Force to get the smokes out to some deserving Rangers! I will definitely smoke the cigar you picked out with the attached note...Thanks for making my and many others day! Your package arrived recently. I sincerely appreciate the cigars and magazines. I am now sharing some good evenings with my work mates over cigars and conversation. I will also be sure to get the other cigars in the hands of some deserving troops. Hope to see you all on my next visit back home. I just received the package! Great selection! Thank you guys for doing this. You all are very generous. I have already given a few out to a wounded soldier from the 101st Airborne Division. We pulled him out of Afghanistan a few weeks back and he is recovering at the hospital here. It looks like they will be sending him home and he will have to get out of the Army due to his injuries. On the good side, he has a baby and a 4 year old whom he has hardly seen. He will be home with his family. I will send you pics as I pass them out! You all take care and I will stay in touch. I like your methods and I stand by my debts so I'll take your deal, though I may still settle with you between now and then. I had the 15 count in mind. I'll plan to share your shipment with others here local to Montgomery to spread the word. When Travis told me about your program to supply cigars to the troops I thought I might be able to help out as well. I'm working ground duties right now but will swap out with another pilot soon. I'll work with Travis to send your cigars down range. As a side note, several friends from the Cloverdale neighborhood speak very highly of your business. Please find my shipping info below. I look forward to meeting you when I return. Your generosity is greatly appreciated. Please express our gratitude to Louie when you see him. The Fuentes will be a an awesome surprise. I garnered a little interest among some of the locals for your shop after mentioning your proposal. I've got quite a few friends awaiting my delivery. Hopefully that will translate to a steady stream of business from delinquent husbands when we return. On the terms of t-shirts: I wear an XL. Travis is likely the same, though he's been working out like a madman lately trying to lose his baby fat. Care to defend yourself Zman? I received the shipment of cigars from you this week and the fellas and I cannot thank you enough! The selection was perfect and we have already smoked a few at our local smoke shed here on the camp, which is a small plywood building with a picnic table under the porch where we usually light up just after dark. I had one of the Oliva's last night and it was great as expected!. Please shoot us your address as we would like to send you a thank you gift in return for you r support to us out forward.The boys and I thank you very much and look forward to getting out to our shed now more often that we have such a great selection to choose from. 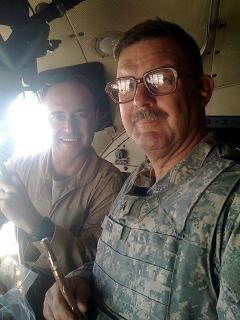 Dave Harwood from his son David who is currently deployed! The deliveries have now been completed! Today I met with the Captain (Major-select) who runs the QRF for the 532nd ESFS (Expeditionary Security Forces Squadron) and distributed cigars to his team. The Lt. Col. insisted that photos be taken of the event so I've forwarded them below, even though the second isn't too flattering for me. I will likely have prints made so if you would like a 5 x 7 or 8 x 10 for the store, just let me know. The Captain is likely someone I'll keep in contact with. You can read a little more about the 532nd here: http://www.af.mil/news/story.asp?id=123174623 In short, they help me sleep at night.